On September 10, 2017, Nigerian government planned a failed assassination attempt on the leader of Indigenous People of Biafra, Mazi Nnamdi Kanu in his compound at Isiama Afara-Ukwu Ibeku, Umuahia, Abia state in Biafraland. Considering this assassination attempt on Mazi Nnamdi Kanu, which the Nigerian Army is presently denying because the attempt to force themselves into Kanu's compound was resisted by IPOB members available in front of the compound; and I ask is that not a clear plan of terrorism? What is Nigerian Army officers doing around the compound of Nnamdi Kanu? It is a matter of law that even if the Federal High Court, Abuja presided over by Justice Binta Nyako decided to overrule itself by unlawfully revoking the bail it granted Mazi Nnamdi Kanu, it is not still Nigerian Army that has the constitutional powers to go for the arrest unless the police reported to the court a fierce resistance of arrest by Mazi Nnamdi Kanu and the Army become drafted. But for now, such occasion has not arise between Mazi Nnamdi Kanu and Nigerian Federal High Court to warrant military invasion. So, it is pure assassination attempt or act of terrorism from Nigerian Army on Mazi Nnamdi Kanu. It is very unfortunate that Nigerian Army had become agency of assassination and terrorism in a pseudo-democratic Nigeria. Nigerian Army has completely lost value before the world as it has been turned into killing machine of civilian population, and latest at the command of Nigerian government to kill Mazi Nnamdi Kanu with view of ending Biafra agitation. However, the Indigenous People of Biafra worldwide are calling on the civilized world to ask Nigerian government what Mazi Nnamdi Kanu did wrong in the eyes of both local laws, regional charters and international conventions to warrant an assassination attempt or terrorist attack on him. Nigerian government has Boko Haram terrorists in Adamawa, Borno and Yobe states which is threatening Nigeria as a country but that is not bothering Nigerian government at all. All the military hardware that Nigerian government and its Army should deploy to fight against Boko Haram terrorists in Northern Nigeria have been transferred to Biafra land with a secret plan to use same to intimidate Biafrans into complete conquest and ultimately assassinate Mazi Nnamdi Kanu. What baffles and continue to baffle IPOB worldwide under the supreme command of Mazi Nnamdi Kanu is why Nigerian government is committing such heinous crimes against humanity in a broad daylight with International community lacking diplomatic will, power and persuasion to caution Nigerian government and bring the principal officers of the government to justice. There is no type of heinous crime which Nigerian government has not committed against Biafrans who are only lawfully struggling to restore their lost political sovereignty as a people. But instead of the anticipated warning to Nigerian government over its excesses in lawlessness, Western world countries such as United States are being rumoured of selling arms and fighter jets to Nigerian government against the principle of Leahy law in United States of America. One question that has to be asked to the civilized world is, has Biafrans not endured all manner of evils enough in the hand of Nigerian government? Had it been that civilian Biafrans were not available to resist Nigerian Army terrorist officers from gaining entrance into the compound of Nnamdi Kanu, may be by now, Nigeria would had gone into flames because the Nigerian Army terrorist officers would have assassinated Mazi Nnamdi Kanu. It is obvious that Nigerian government had lost the legal battle with IPOB and Mazi Nnamdi Kanu as a person in the court of law both in Nigerian Federal High Court and ECOWAS Court and thereby has chosen to take the route of extra-judicial move to assassinate Mazi Nnamdi Kanu through the instrumentality of the military siege in Biafra Land. However, IPOB worldwide want the world to caution Nigerian government over the dangerous move which it is making at the moment because any attempt to assassinate Nnamdi Kanu is an attempt to assassinate over 80 million Biafrans who are at his command and ready to die for him. Nigerian Army officers who invaded the compound of Mazi Nnamdi Kanu on September 10, 2017 can testify that Biafrans are ready to die for Mazi Nnamdi Kanu as three IPOB members were shot by Nigerian Army, yet, it does not deter the armless civilians from denying the lawless hoodlums called soldiers entrance into the compound. In conclusion, Nigerian government should stop going outside the law in its case with Mazi Nnamdi Kanu through the present assassination attempt left and right but sustains the legal battle with Mazi Kanu in the court because it will save Nigerian government irreparable loss of lives, property and other resources to win Nnamdi Kanu and IPOB inside court than winning them in the battle field. Biafra must be free from this Hellfire called Nigeria. Shame to Nigeria and their uneducated illiterate Army. They can not fight Book Haram that have been killing people in the North and they are in the peaceful area like Abia State Biafra Land shooting unarmed and peaceful IPOB members for asking for Referendum. SHAME TO NIGERIA. BIAFRA FREEDOM IS ALREADY HERE. The zoo must fall. They know they are dying. They are just trying to hold on to anything to survive but that can't be possible. 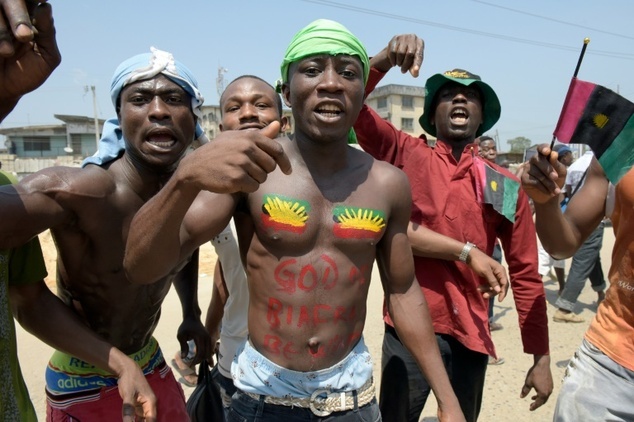 We are Biafrans and we will never surrender this time arround.